If you’re looking to build a small form-factor machine, Cryorig has a new cooler that might be just the ticket. The C7 compact cooler stands at 47mm tall, a mere 2mm taller than Intel’s stock heatsink, and its width x length dimensions are 97x97mm, so it should fit in just about any case design, without getting in the way of your RAM or PCIe slots. The C7 weighs 357g, and features four 6mm heatpipes and a 92mm fan which runs at 600-2500rpm. For its size, it’s a powerful little thing. 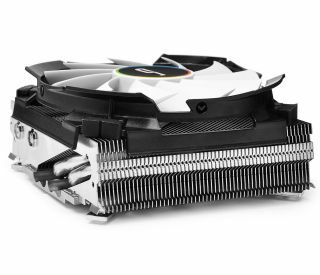 Cryorig claims that the C7 provides 25 percent more cooling capacity than stock AMD and Intel heatsinks, as well as being 20 percent quieter, supposedly making up to 30 dBA of noise. That extra cooling potential should give you the thermal headroom to do some CPU overclocking while maintaining reasonable temperatures in a tiny case. It will be competing with the likes of the Noctua NH-L12 and NH-L9 coolers for use on Mini-ITX boards, and although the Noctua L9i's heatsink is a little smaller, it’s also more expensive at around $43 on Newegg. The MSRP for the C7 will be $30.